Two floor villa located in Club Patara Kalkan with 3 bedrooms with a capacity of accommodating 6. A large terrace to dine, sunbath and get relax surrounded with tropical flowers and plants. A luxe living room with an open kitchen are convenient for holiday use. BBQ is located in the terrace for ease of use. It has direct access to the blue flagged sea with 5 min walk. Facility has 3 pools, 2 is filled with sea water. A market, SPA and a fitness room is available in the facility. 3 restaurants are for use for breakfast, lunch and dinner. A shuttle bus runs every 15 min within the facility. A shuttle boat also runs between the Club and Kalkan town that is a joy ride. It has several ancient towns surrounded that gives opportunity for sight seeing. Hidden city, ancient under water town, ancient Letoon city and longest beach are among you can visit. You can enjoy the feast in Kalkan restaurants and hospitality. Hello. My name is Rengin Onay, owner of the villa you are visiting. I live in Istanbul and working for a global brand as its senior executive. 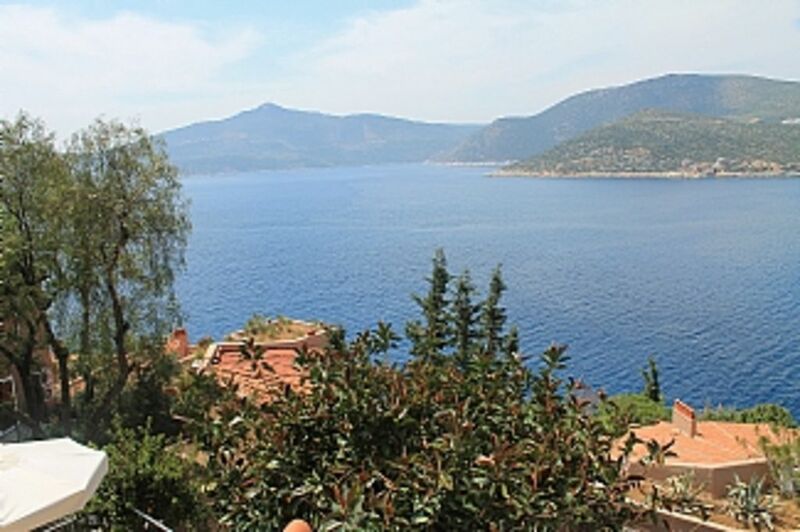 As a family we love Kalkan and we describe it as heaven on earth at which we all find peace and happiness. Hope you will like it as much as we do. Have a nice stay. It has the most stunning view, suitable for family with kids.. it is our heaven on earth. Its sea is one of the rare blue flagged waters. It is a very safe village for families with kids and young adults. A truly amazing unforgettable holiday opportunity. Fresh sea food and delicious Turkish food is available everywhere. You can also use our facilities available in Villa to cook your meals. Main bedroom has bathroom with shower. Second and third bedrooms share another separate bathroom. A third WC is located at main entrance level. Best Villa in Kalkan with its location, stunning view, five min to blue flagged sea, elegantly decorated, at the heart of a award winner resort. Living room has one large sofa and two armchairs. Large dining table with six chairs. TV, fire place and with AC. Full kitchen with refrigerator, stove and oven, toaster, dishwasher, plates, glassware and utensils. BBQ is located in the terrace. Outside: Tropical trees and flowers surrounds the garden. Bbq is available on the terrace. There are 3 shared swimming pools. 2 are filled with sea water. One is located at the top of a hill with amazing view. Billards, kids play ground, tennis and basketball courts are available. Shuttle, market, SPA, inner pool, fitness, three restaurants are also at your service. And all types of water sports incl scuba diving are available by the beach. Utility Room: Washing machine, all cleanining materials are available. Cleaning / Towels / Linen / Maid service: Towels and linen are included once a week free cleaning service Other: Terrace is large enough to have two sofas and dor dining. There are two sunbathing beds available. Villa çok güzel ve temiz,huzurlu bir tatil geçirmek isteyenlere birebir.Fakat club için aynisini söyleyemiyecem,havuzlari çok bakimsiz,büyük havuz yine idare ediyor ama tatli su havuzu çok bakimsiz,biz bir kere girdik bir daha da girmedik.çalisanlar çok ilgisiz ve çoçuklu aileler için tavsiye edilecek bir tatil clubu degil,bebek arabasi ile imkansiz,her yer merdiven.Aslinda çok yazik etmişler,biraz bakim yapilsa çok güzel bir yer ama dedidim gibi çoçuklu ailelere tavsiye edemem. Dalaman is the nearest airport. Dalaman to Kalkan distance is 130 km Transfer time is 1.30 hours shuttle services. You can rent a car or a pick up service can be made available for you at your own cost. I suggest that you rent a car because it is much more comfortable as you will choose to travel around the town. There are plenty of restaurants and many bars and shops in Kalkan all of which open early in the day and stay open at least midnight. Shopping in Kalkan is completely hassle-free. In Kalkan you can find any food or item that you need. It is especially a Britain friendly town. In summer almost 70% of the population is from the UK. Therefore it is reach offerring what you will look for. All shops markets are open till mid night. Local shops offer quality leather goods and many surprises you can discover. Shop and restaurant owners are very friendly and all speak very fluent English. Restaurants offer local food, international cuisine and rich sea food. Booking Notes: Weekly rent is 900.00 UK pounds a week. 50% of the total booking amount is required for reservation confirmation. Remaining amount has to paid one month prior to check-in. Changeover Day: Check-in dates are preferreed on Saturdays. However there can be flexibility depending on the availability of the villa.